The soft interior of the fruit stone (em­bryo). Rosaceae (rose family), sub­family Prunoidae. 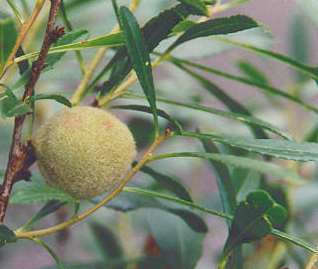 Sweet almond have a faint, nutty fragrance and taste; bitter almonds taste strongly bitter and develop an intensive, characteristic aroma with moisture (e. g., by chewing). Almonds (bitter as well as sweet) contain about 50% of a fixed oil, which is, though, too expensive to be used for cooking. It is made up of glycerides (80% oleic acid, 15% linoleic acid, 5% palmitic acid). Bitter almonds contain 3 to 5% amygdalin, a so-called cyanogenic glycoside composed of mandelic nitrile and gentobiose. 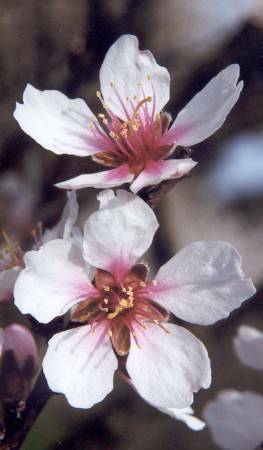 Vegetative parts of the almond tree accumulate the analogous prunasin (with glucose as sugar component). Amygdalin is occasionally referred to as Vitamin B17 , primarily in the context of obscure cancer therapies. On enzymatic hydrolysis of these glycosides by β-glucosidases, the aglycon mandelic nitrile (2-hydroxy-3-phenylacetonitrile) is liberated. A second enzyme (mandelonitrile lyase) converts mandelic nitrile quickly to benzaldehyde (C6H5–CHO) and hydrocyanic acid (HCN, also known as prussic acid). By chance, both compounds are olfactorily similar, but hydrocyanic acid is highly toxic; bitter almonds’ value as a spice is only due to the benzaldehyde. Hydrocyanic acid is a dangerous poison (about one twentieth of a gram is considered lethal for an adult), but it is also very volatile and susceptible to hydrolysis at higher temperatures. Therefore, significant amounts of hydrocyanic acid are highly unlikely to accumulate in any dish prepared with bitter almonds. On the other side, incorporation of whole raw bitter almonds is fairly dangerous because, in this case, all of its hydrocyanic acid is formed in one’s stomach. Serious poisoning is quite rare with adults, but children may be killed by just a few bitter almonds. 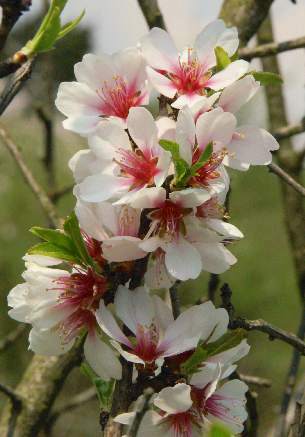 Very similar warnings hold for other plants of the genus Prunus, the kernels of which all contain amygdalin (though in smaller amounts): Peach, apricot and, to an even lesser extent, cherry and plum. 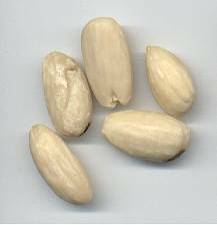 One kernel of bitter almond yields about one milligram of hydrocyanic acid. It should be noted that bitter almonds can only develop their aroma if both water and the necessary enzymes are present. 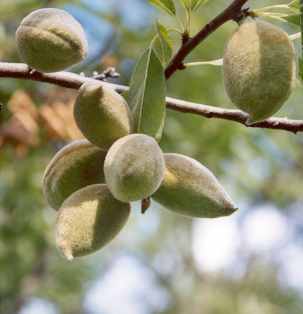 The two enzymes (called together emulsin) are de­activated by heat; thus, bitter almonds must never be fried nor toasted, for they will not develop almond aroma afterwards. 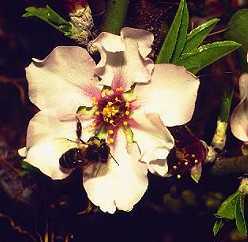 Sweet almonds are, by centuries of cultivation and breeding, very low in amygdalin and, thus, harmless; however, even sweet almond trees sometimes yield single bitter almonds (up to 1% of total crop), and some sweet almond cultivars still contain traces of bitter almond aroma. This does not apply to Californian almonds, which can be regarded totally destitute of amygdalin. Principally, sweet and bitter almonds are very different products and can never substitute each other. 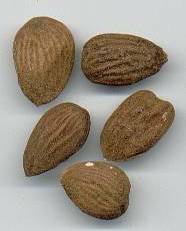 The origin of almonds is variously given as West or Central Asia; yet due to many millennia of cultivation, their original distribution cannot be reconstructed. In temperate Europe, almond trees do not thrive, although their cultivation has been tried in the Middle Ages due to the Capitulare de villis (see lovage). Today, the most important producers for the European market are Spain and Italy. 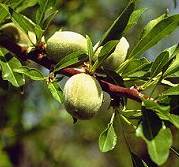 Californian almonds are of increasing importance. 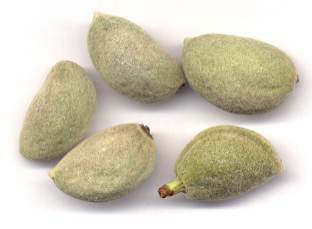 Almonds’ names in almost all European tongues essentially derive from Greek amygdale [ἀμυγδάλη] or amygdalos [ἀμύγδαλος] almond , whose origin is not known. The element al- got attached to the English and Spanish names by confusion with the prefix al- in many Arabic loan words found in Romance tongues; see also caper on this topic. Arabic al-lawz [اللوز] is reflected in some other languages like Maltese lewż or Swahili lozi; I do not know of its origin, but there is probably a relation to Pahlavi lawzenag which denotes a sweetmeat prepared from almonds, probably smilar to today’s marzipan. 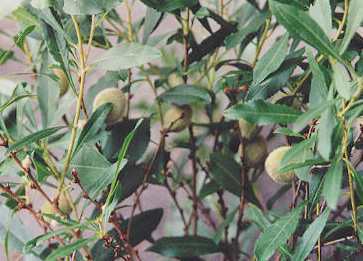 Maybe there is also a conncetion to Akkadian lūku [𒄑𒇴] almond tree . Another Old Semitic term, Akkadian šiqdu and Ugaritic thaqid [𐎘𐎖𐎄], has a relative in Hebrew shaked [שקד], by which the tree is referred to in the Bible (see pome­granate). 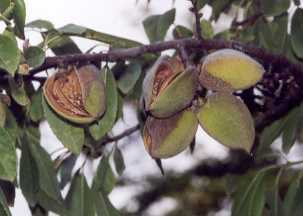 Many languages of Central Asia and India name almond as badam; for example, the name is the same in Farsi, Kazakh, Marathi and Punjabi [بادام, бадам, बदाम, ਬਦਾਮ], and similar in countless other languages. This is probably an ancient word because it already appears in Pahlavi (Middle Persian) as wadam and in Sanskrit as badama [बादाम] or vatama [वाताम]. Via Turkish badem, that name entered some South-Eastern European tongues, e. g., Albanian bajame and Bulgarian badem [бадем]. The botanic genus name, Prunus, is derived from the Latin name of the closely related plum, prunum, which in turn goes back to Greek proumnon [προῦμνον]. 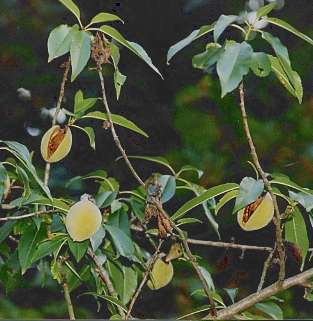 The species name, dulcis sweet is motivated by the kernel’s taste; bitter almonds are considered a variety (var. amara), where Latin amarus means bitter . Latin dulcis is the progenitor of most terms for sweet in Romance languages, e. g., French doux, Italian dolce, Portuguese doce and Catalan dolç. Note that the Greek cognates glykys [γλυκύς] and glykeros [γλυκερός], which underlie English licorice, have a differing initial consonant. The Latin form could have evolved by dissimilation of a hypothetical gulcis, but etymological dictionaries usually prefer derivation from an otherwise poorly attested Proto-Indo–European root DL̥KU sweet and postulate assimilation in the Greek words. However, in that case it is difficult to explain Sanskrit gulya [गुल्य] sweet and gula [गुल] sugar, molasses , which was borrowed by Indonesian as gula, which means sugar (particularly palm sugar) and sweetmeat in general. I suspect that Slavonic terms for sweet (exemplified by Russian sladki [сладкий] or Polish słodki) belong to the same kin, but was not able to verify this. Sweet al­monds are much used in Middle Eastern cuisine; in Northern Indian cooking style, which was heavily in­fluenced by Persia, they are widely used, besides poppy seeds, as a sauce thickener (in whole India, wheat flour is never taken for this purpose). Typically, almonds are fried together with several spices (mace, cinnamon, cumin and garlic or ginger) and then quenched with yoghurt. Almond pieces browned in butter fat (ghi) are a popular, aromatic decoration for fragrant biriyanis or other dishes of meat with dried fruits. Some Indian desserts also contain almonds, e. g. badaami kheer [बादामी खीर], a rather liquid almond custard flavoured with saffron or rose water. Other types of kheer may contain rice, semolina or thin noodles (vermicelli). For a fuller account of the Persia-influenced cuisine of Northern India (Moghul cooking), see black cumin. The most famous product of Western cuisine containing almonds is marzipan (also spelled marchpane). This confection is basically an intensively kneaded mixture of ground almonds, sugar and aromatic essences, frequently rose water. For this recipe, sweet almonds are either used alone or flavoured with one or two bitter almonds per 100 g of sweet almond; you might also try just a hint of bitter almond essence. 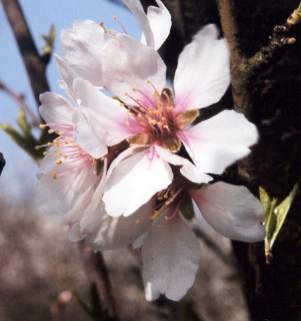 Since bitter almonds are toxic, they are sometimes hard to get in Western countries, owing to paternalistic laws; bitter almond essence is, then, the only way to achieve bitter almond aroma. This essence is made by distilling a mixture of ground bitter almonds and water; it is more or less pure benzaldehyde, containing no hydrocyanic acid. Almond essence is well-suited to flavour cookies, cakes and marzipan. Since it is very strong, care must be taken not to overdose. If not available, kernels of peach or apricot can also be tried. Another possible substitute for bitter almonds is the tonka bean in small dosage; yet also this spice may be not altogether harmless. Bitter almonds’ usage in kitchen is mostly limited to sweets. They can, though, be used to flavour spicy dishes, thus giving a very exotic taste. Careful dosage is essential and requires a lot of skill or practice. You may try them, for example, for Chinese fried pork (that’s not my idea, but Stobart’s).